Bio: As both a guitarist and a music enthusiast, Hoggie has been developing a perpetual interest for and experimenting with various genres of music such as jazz, rock and progressive, throughout the years of experience. Strictly rhythmical forms of music, however, were not something he was exposed to as much. His knowledge on rhythm and rhythmical instruments fall short; some basic beats and physical aspects of the drum set he learned from the drummer from his band in highschool margined his interest in rhythm. But when he arrived at Cornell to pursue his academic goals, Hoggie had the opportunity to broaden his musical horizon through watching Yamatai perform. On the last day of PREPARE, a pre-orientation program at Cornell, he experienced the immeasurable energy and rhythmical technicalities of Taiko drumming for the first time. 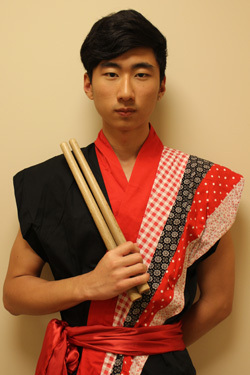 Yamatai's performance shocked him greatly, and helped him develop a new passion for Taiko drumming. It was not long after the performance that Hoggie decided that he would persevere through any ordeals to make himself a part of the club.